Agra is the city where the Taj Mahal is. She is in the state of Uttar Pradesh but is not the capital of the state. 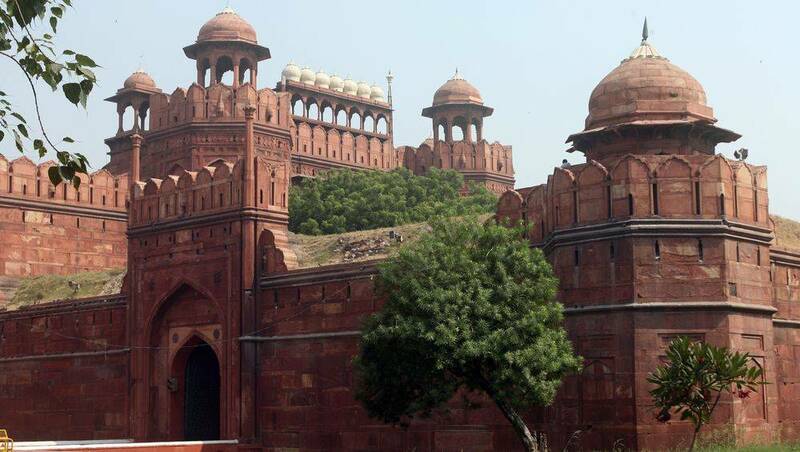 It is also known to house the Red Fort. Its population is 1,700,000, a large proportion of whom are young people. 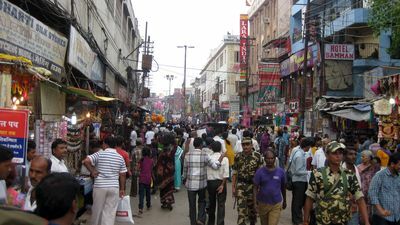 Although the city is well known for its exceptional world heritage, it does not have the appeal of other Indian cities and is not, in itself, a travel destination. It is only because it possesses on its territory these two monuments that it is so frequented. 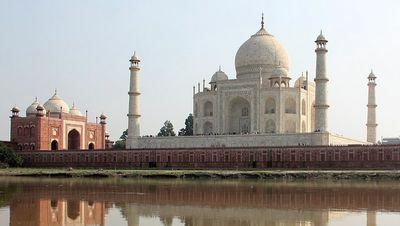 Agra is not an easy city to reach, but it is not the worst city in India either, it remains at a reasonable distance from the capital New Delhi. If you arrive by plane, know that there is an airport in Agra, but it is little served by international companies, it will probably arrive in India by other cities. If your goal is to visit only North India or even Agra, you will probably arrive in New Delhi from where you will take an internal flight operated by an Indian domestic airline: Kingfisher Airlines and Air India Regional by for example, these air operators also have lines to Jaipur. Of course it is the most expensive means of locomotion, and in addition, it is not always always on time. If you arrive by train, it will cost you only 6 Euros, plus one or two euros of fees. There are advantages and disadvantages, of course. One of the advantages and you will not care for anything, the hotels or local travel agencies are responsible for buying tickets for you and for telling you where to go. In addition to this price you will be entitled to an air-conditioned cabin, rather high-end. And you'll be in Agra at a speed quite acceptable, in about 3 hours. Finally trains are relatively on time, compared to other means of transport. The disadvantages are that you have to plan your trip in advance, the trains are quickly crowded and you will not have room if you go too late. The trains going to Agra are the Bhopal Shatabdi Express and the Taj Express, which are the two classic trains for tourists. The others are more for the inhabitants, which does not mean that we should not mix, but rather that the state of Uttar Pradesh prefers to organize trains for tourists so that they have a comfort that locals do not have not. So if you wish, go through other trains, they will be more authentic. 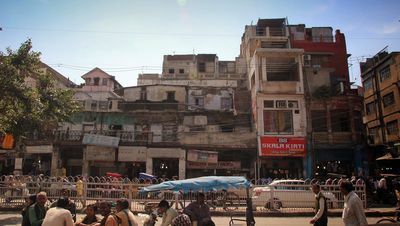 Note that the journey from the station to the hotels usually costs between 50 and 200 rupees. And know that there is another station in Agra, Agra Fort Station. Instead, it serves trains arriving from the east. If you arrive by taxi, it will take you about 5 hours to get from New Delhi to Agra. It is quite economical, especially if you are several, and you will see both the scenery and the art of driving in India without the inconvenience. Yes, driving in India is so much art that it seems complicated to ride normally while avoiding pedestrians, permanent sources of danger. Not to mention the animals. The disadvantage of the taxi is common to the bus and the private car: The travel time is random, ranging from 5 hours if everything goes well at ... a certain time, if everything goes wrong: Accident, traffic jams, checks, etc. If you arrive by car, good luck! In between avoiding pedestrians, other vehicles, finding your way while keeping your focus all the way, you should arrive exhausted, and much later than planned, you're not used to it, unlike taxis. This is a solution that I can not advise. If you arrive by bus, you will need to take your ticket well in advance because they too are quickly crowded. A bus but normally 5 hours to reach Agra of New Delhi, but it is common that it puts more according to the conditions of traffic. There are two bus stations in Agra, the Idgah Bus Stand and the ISBT (Inter state bus terminal). Note that bus and car you can stop at Mathura, it allows to split the trip in two parts and the place is nice. Curiously the climate of Agra is of tropical type, with a rainy season starting in June and stopping during the month of September, so during all our summer. And when it rains in Agra, it's raining. We record up to 660 millimeters annually, knowing that the rest of the year it hardly rains. Temperatures have a great amplitude, ranging from 45 ° C in summer to 4 ° C in winter, but generally winters are sweeter than that. To visit Agra the best months are October, November and February, and possibly March, but know that the city remains interesting the other months, it is just either overpowered by heat, or in the rain. Two conditions that are not really redibitory but that make the stay less pleasant, especially during the hot weather since the city is heavily polluted. The Taj Mahal - No need to settle here, this website is dedicated to him. The red fort - Very nice stronghold of Agra, also of global reach. 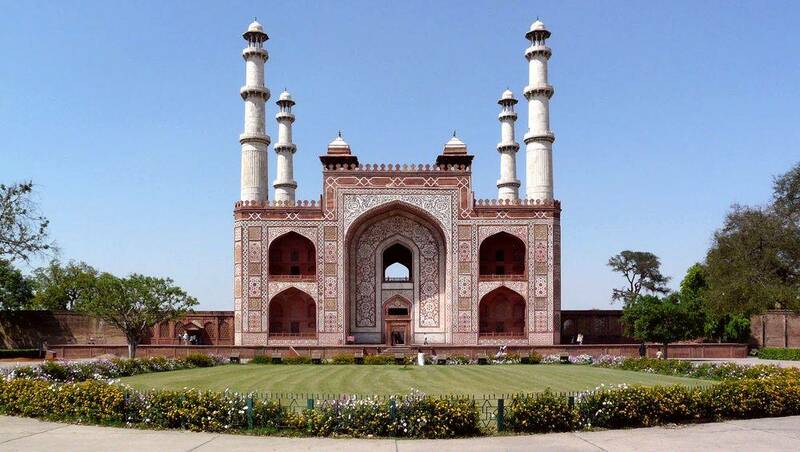 It was built by Akbar and has been extensively redesigned. Shah Jahan was locked there for the last 8 years. The style of this fort is a mixture of Hindu art and Muslim tradition, it is the first major example of what will later be the Mughal architectural style. 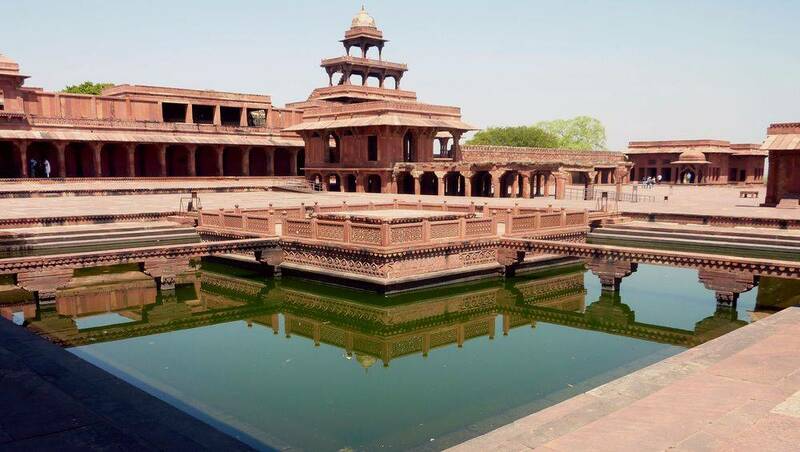 Le Sikandra - This is the tomb of Akbar, it is a mausoleum in red sandstone of Hindu style with a Muslim influence. It is 4 km north of Agra, on the road to Delhi. 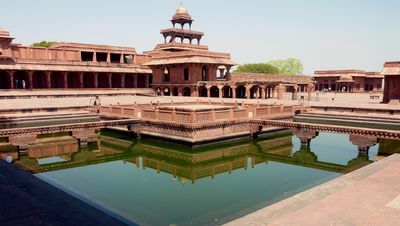 Fatehpur Sikri - This ancient imperial city is 37 km west of Agra. It is remarkable for the good conservation of the architecture of the sixteenth century, in red sandstone. Fatehpur Sikri's visits are usually made through an excursion dedicated to him or by a stop along the Jaipur road. The Sikandra, it can be visited from Agra with a taxi, it's still the simplest. The city of Agra before the sixteenth century is poorly documented, but we know that it was a small city that developed along the Yamuna River. When Bâbur conquered the northern region of India and founded a new dynasty, Agra was chosen to host the first Mughal Garden. It was created in 1526. The creation of this garden was not anecdotal. It was for Babur to show his power by taming what is probably the wildest of the existing elements: Nature itself. For a people from the desert regions, the presence of a garden in a place was a symbol of power. The Mughals accentuated this power by ordering their gardens perfectly, to impose the forms they desired. This artistic expression also had a religious and funerary purpose, religious because the Muslims see a garden as a symbol of Paradise and funerary because this symbol is necessarily closer to the deceased. But to build this garden, Babur caused a large part of the population to be expelled, and the inhabitants lived near the river, which seems normal. However, it is precisely along the river that was to be built gardens. And those gardens were big, very big. The first of these gardens, Ram Bagh, was followed by a vast urbanistic complex of rectilinear architecture, integrated in other gardens, all stretching that more than one kilometer along the river. On this occasion a sort of stone quay was built, high enough along the shore, to mark the delimitation between the bed of the river and the arrangement of the gardens. It is this quay that was at the origin of the future development of the city of Agra. In the following century, a riverside town in the Mughal gardens was in full swing and had even developed on both banks of the Yamuna River. It included the reconstruction of Agra Fort by Akbar, which was completed in 1573. By the time Shah Jahan ascended the throne the Agra population had reached about 700,000 people. The city was considered, according to the chronicler Abdul Aziz "a wonder that is worth as much by its center as by its arteries, its trade by land or sea, like a place of meeting of the saints, sages and scientists of all Asia." 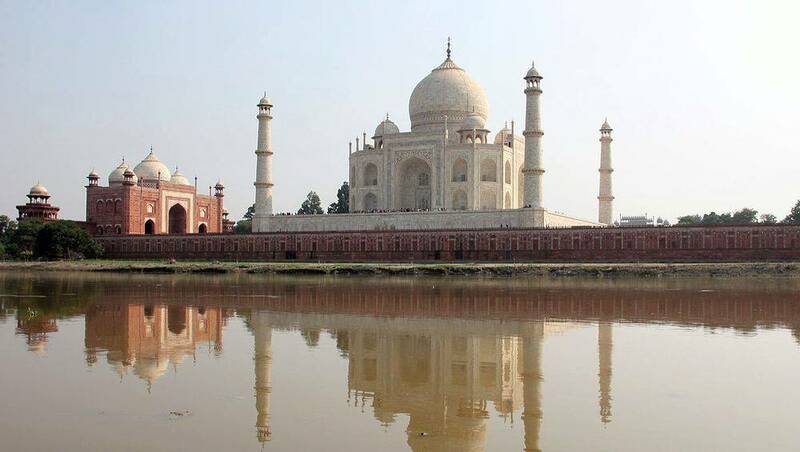 In the 17th century Agra had become a city centered on its seafront and had developed partly to the east, but mainly to the west, towards the rich lands that bordered the banks of the Yamuna.